MR Online | The uneasy U.S.-China relationship: what lies ahead? 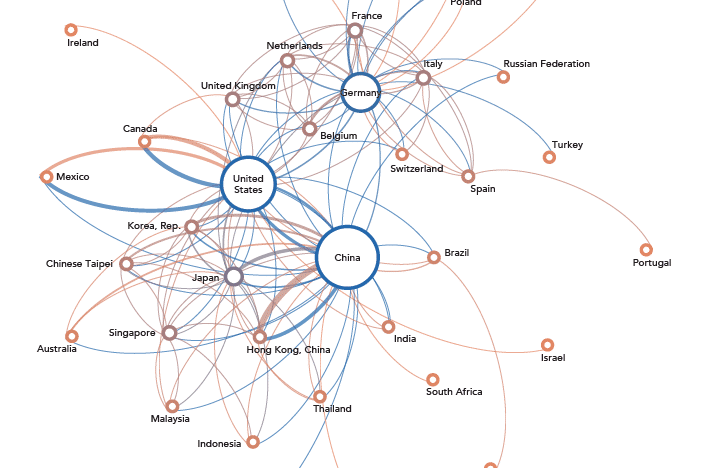 The U.S. and China are the two dominant poles in the global economy, as illustrated in the figure below which traces the global trade in parts and components. And they have a very uneasy relationship. However, despite current tensions, it is unlikely that either side will succeed in dramatically changing it. The main reason is that the relationship has been heavily shaped by the activities of leading multinational corporations, including from the US, and their interests in maintaining it can be expected to set limits on the actions of both governments. The U.S. government for its part sees these efforts as a challenge to U.S. dominance and has taken steps to block them and to isolate China. For example, the U.S. has levied tariffs on Chinese exports to the US, and has demanded that China do more to respect U.S. intellectual property rights and open up more domestic markets to U.S. firms. It has also sought to stop other countries from using Chinese technology, especially in their wireless networks, and from participating in Chinese organized regional organizations and initiatives. It also seeks to include a so-called “poison pill” clause in the US–Mexico–Canada free trade agreement which would limit the ability of Canada and Mexico to sign trade agreements with China without U.S. approval. The U.S. hopes to insert such a clause in other trade agreements in order to force countries to choose whether to have closer economic ties with the United States or with China. It has also greatly expanded its military activities in areas surrounding China, for example, in Vietnam and the Philippines. 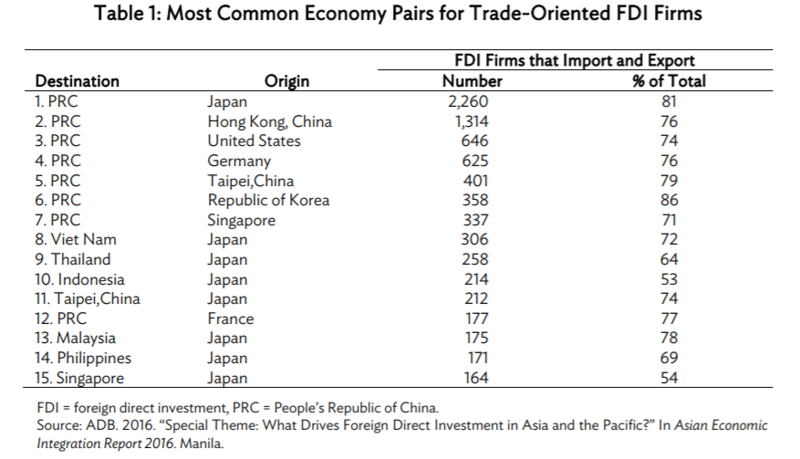 This positioning by foreign firms in China, as both importers and exporters, means that China, and emerging East Asia more broadly, remain tied to the global economy, and in particular the U.S. economy. 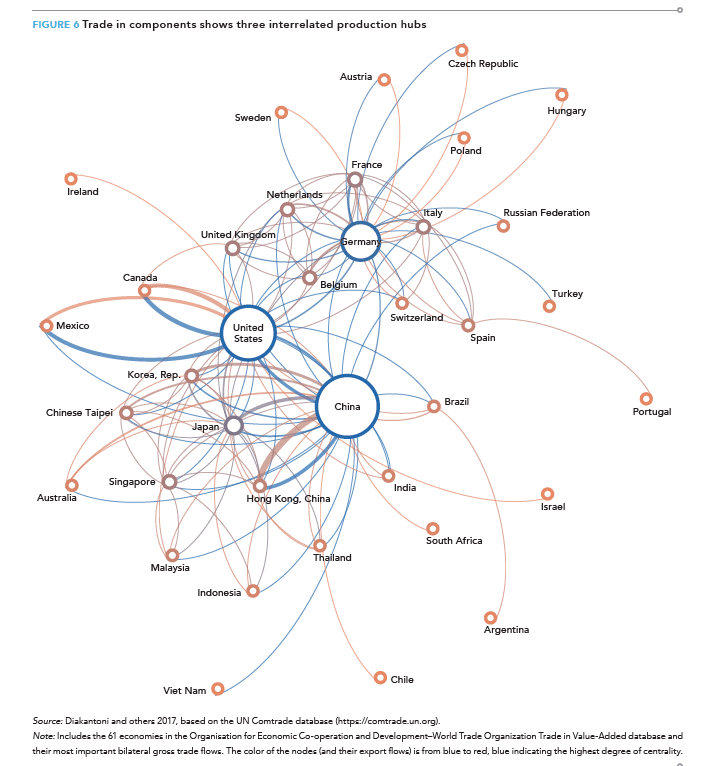 The continuing strength of this relationship is highlighted in the following figure from the Asian Development Bank study. 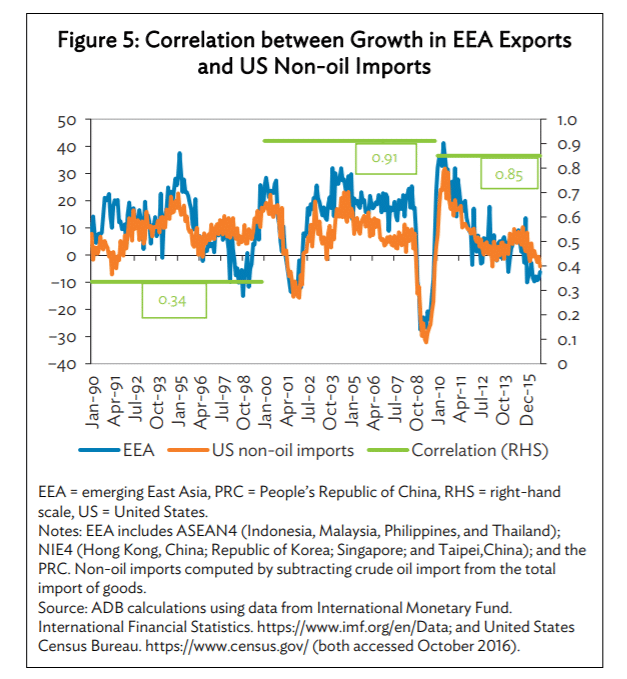 The high correlation of 0.85 between the growth in U.S. non-oil imports and the growth in exports by emerging East Asia (which includes the PRC) in the period after the Global Financial Crisis, makes clear that there has been relatively little decoupling since the crisis. 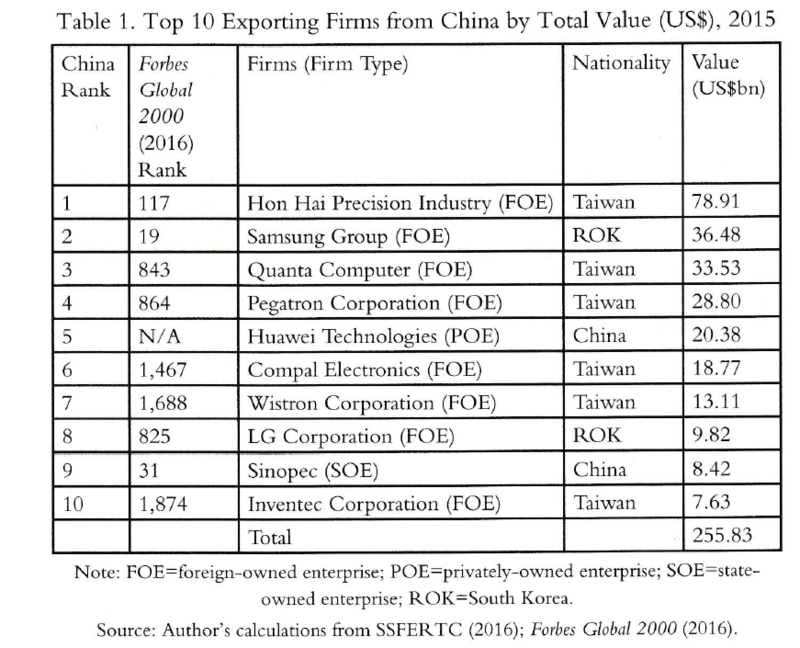 The overwhelming majority of China’s top electronic exporters are foreign firms (especially Taiwanese and South Koreans–only Huawei makes the top ten) Samsung and LG perform their own final assembly in China but Western TNCs (including increasingly Japanese) prefer to outsource their lower value production to Taiwanese firms operating in China. It is well-known that many leading U.S. multinational corporations, including firms like Apple, Nike, and Walmart, depend on China-based production for their U.S. sales. What is less well-known is that many U.S. multinational corporations occupy highly profitable positions in Chinese domestic markets. For example, 2017 marked the sixth consecutive year that China was the top market for General Motors in terms of both sales and profit. Starr lists several other important examples: Google has a Chinese market share in smartphone operating systems of over 70 percent. Microsoft has a 90 percent market share in desktop operating systems. Boeing has a 45 percent market share in airplanes. Coca-cola has a 63 percent market share in carbonated soft drinks. Starbucks has a 55 percent market share in coffeeshops. Cisco has a 55 percent market share in ethernet switches. 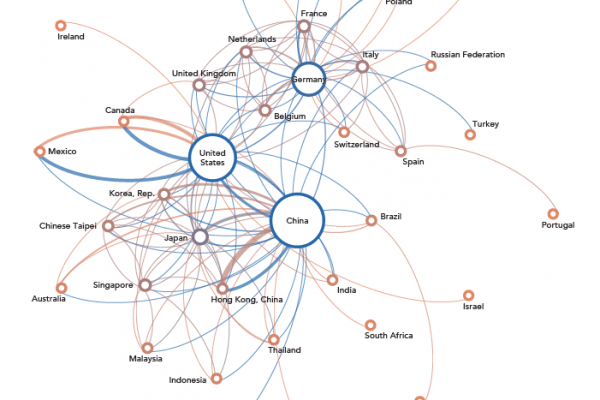 Thus, China is extremely important to the operation and profitability of leading U.S. firms. And any U.S. administration would have to think very carefully about the economic and political repercussions if it were to pursue policies that triggered a serious disruption in existing economic relations with China. In sum, it is clear that both governments operate subject to real limits set by powerful multinational corporations, limits that will likely constrain China’s push for decoupling as well as the U.S. drive to isolate China. That said, it is important to keep in mind that there is an even more powerful force that could undermine the stability of the relationship and the contemporary global economy: the growing contradictions at work in both countries that have led to massive inequality and workplace resistance, ever slower growth and financial imbalances, and the likelihood of recession in the United States.